Thanks to its expertise, ProteoGenix is able to provide you with diverse high-quality naive libraries for phage display services and from different antibody formats: scFv, Fab or even VHH format. Example: 3-4 months from a naive library panning VS 9 months for standard hybridoma technology to get a purified recombinant antibody sample! We work on huge libraries of up to 1010 variants. We have more libraries in scFv format because they are genetically more stable than the Fab format. But the advantage of the Fab format is that it is possible to select in a more simple way the binders (by avoiding the risk of formation of dimers or trimers). More libraries of other species may be available upon request. A screening of the chosen library is carried out by ELISA in order to identify high-affinity binders of the protein of interest. During the interaction between the binders and the protein, binders will remain attached to the well while non-binders will be eliminated by washing. Binders are eluted and then recovered to infect bacteria (with a helper phage) and increase their quantity. 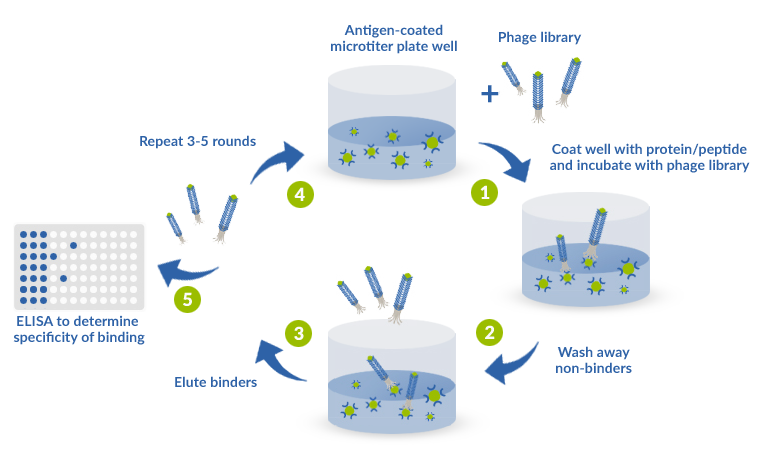 The repetition of this method is called « panning » (or also called « biopanning ») and allows to select the best binders, which are then isolated for validation in ELISA. At the end, the DNA of the best binders is sequenced thereby allowing to produce them as recombinant proteins. ProteoGenix generally performs 3 to 5 steps of panning to ensure you get the best possible candidates. All the sequences can be provided to the customer. ProteoGenix guarantees 3 to 10 binders but it is possible to supply more binders according to the requests of our customers. Affinity maturation can then be performed with the best binders if necessary. For more information or to get a quote for our phage display services with the use of naive libraries, please contact us.